Magnesium is important for calcium regulation. ** Magnesium also supports crucial bone health. ** A study found that higher dietary magnesium intake was positively associated with sugar/glucose metabolism. ** Magnesium can be found in foods such as spinach, black beans, potatoes, peanuts, brown rice and chicken breast. Did you know that Magnesium absorption decreases with age? 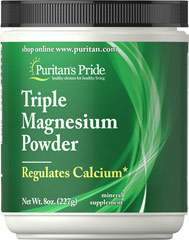 This triple Magnesium powder supplement consists of three different forms of Magnesium - Magnesium Oxide, Magnesium Aspartate and Magnesium Citrate. The convenient powder form allows you to mix this supplement with the beverage of your choice for a delicious alternative to pills or capsules. One serving delivers 400 mg of Magnesium.